Necrobarista is a visual novel about a Melbourne café where the dead are, for one night, granted the chance to talk and mingle with the living once more. Developer Route 59 lists their inspirations as both anime and film, and it shows. 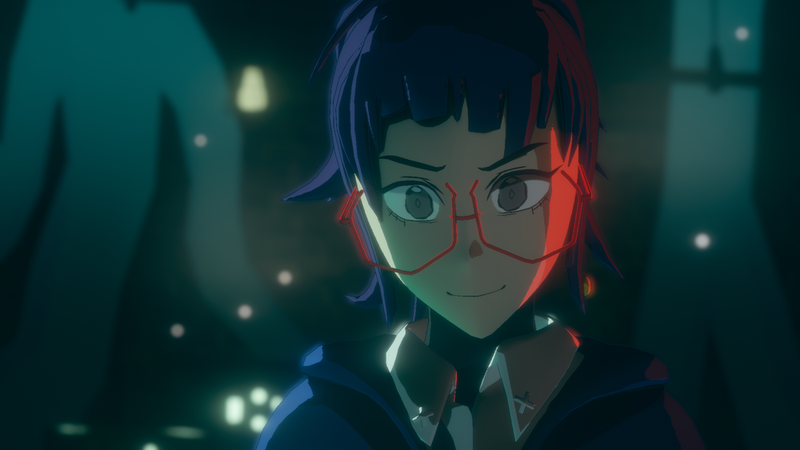 In the short demo I got my hands on at PAX, the presentation is very cinematic as you interact and converse with characters, especially when compared to the usual style for visual novels which usually has the character you're talking to rotating through different emote poses as you read the conversation. Visually the game is an easy sell, especially for visual novel and anime fans. It has a striking style that shows Japanese animation inspirations but equally isn’t formulaic or stereotypical in its character designs, as is the case with a lot of what generally comes out of Japan -- especially when looking at female characters. I don’t feel confident enough to talk about the story much, I only got to play the game for probably somewhere short of 10 minutes before I encountered what someone from Route 59 called “a rare bug” and my time was cut short. Showing a visual novel on the PAX show floor also just seems a hard place to sell a game so heavy on story and character, which is why the reliance falls to the games art -- where Necrobarista easily shines -- and quick impressions of the mechanics and characters of the game. Maddy, the barista, and I believe the main character of Necrobarista, made a quick and funny impression on me as she greeted another character with a “hey mate” and quickly cemented that despite how Necrobarista may look, it is most definitely set in Australia and is an Aussie developed game. Where the majority of visual novels let you pick from a variety of conversation choices, Necrobarista also has you picking up keywords from conversations for use later on. As a character is talking you’ll see some words appear in yellow that you can then collect, although to be honest, I never saw a chance -- or reached a point -- where I could use any of the words I was picking up. It was also confusing as you could only have a max of four words at a time but there was no real guiding factor to which words I should or shouldn’t be holding on to as more appeared I could collect. The system was reminding me of Danganronpa where you collect a keyword from a selection in the trial system and have to use it on the correct word in someone else's rebuttal to shut it down and advance the stage. Here I was collecting words to use later on, but not knowing really what direction with the conversation choices I should be headed in, or trying to be headed in. In fact, I was simply picking the darker tone words just because I could, hoping something would come of it, but alas, not in my demo time. Necrobarista looks to be offering a fresh and unique entry into the visual novel genre that can often feel very dull and flooded. The cinematic art-style will make spamming the screenshot button a must and the characters that I briefly met were visually striking and distinctively Australian. Any issues and confusion I had I’d write-off as just the downside of such a short and non-guided demo, that was cut even shorter with a small bug. Necrobarista is currently scheduled to release on Steam, Nintendo Switch and PS4 sometime in 2019.